I have always hated petunias. REASON: My third grade teacher told my mother that I read too much, and they devised a plan to make me water petunias every day to keep me out of the house. I retaliated by moving covers from book to book to hide the number I actually read. I don’t have a sweet tooth, except for chocolate. BUT: I can eat a can of Pringles or a bag of cashews in one sitting. When my sister introduced me to eating potato chips with Hershey bars, I found true joy. I held a White House press pass for a day. REASON: I wrote for a national publication interested in a particular press conference given by President Carter, so I asked for credentials. I love anchovies and often cook with them. CHALLENGE: You probably eat them more often than you know. Check the ingredients list of Worchestershire Sauce. I’m afraid of heights and bridges. BUT: I once walked across the Chesapeake Bay Bridge with my heart beating my eardrums for all four and one-half miles. Letters from Earth http://kath-lettersfromearth.blogspot.com/ Kathleen Marsh records random thoughts about life in general and marriage in particular. Her husband, the Prince Consort, is a frequent participant. Fiori di Zucca (Squash Blossoms) http://fiordizucca.blogspot.com/ This blog is in Italian, but it is full of authentic recipes for Italian food--all translated into English. To find the English version, click on any recipe under “Menu” then scroll down. The English version follows the Italian. Mystery Lovers Kitchen http://www.mysteryloverskitchen.com Eight mystery authors, who all write books about food, blog about it, too. Every day there’s a new recipe plus news about the books from these award-winning writers. 2Friends4Cooking http://www.2friends4cooking.com/wordpress/ Ren Finch writes this small blog which offers information about unique events in Italy and great recipes. In the past, Ren has held cooking classes in her home near St. Peter’s. She has recently moved to Tuscany and will be offering cooking classes there very soon. This blog will tell when. Diane Vallere http://dianevallere.blogspot.com/ Diane writes about shoes, clues, and clothes and other random thoughts. If I have mentioned your blog, you can accept the award by passing it forward. Write five random facts about yourself and five short reviews of other blogs. 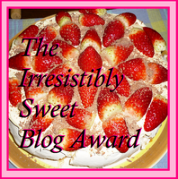 Love the idea of the award...and I could eat that delicious looking sweet in one sitting. It's a good way to learn about other blogs. And the cake looks fabulous. I'm dieting and have eaten NO cake or other sweet for one month. This virtual one is the nearest I've come.